It's policy to remove provoking posts. The idea is that when you remove a provoking post, the effect of provoking gets negated, which is exactly what we want. 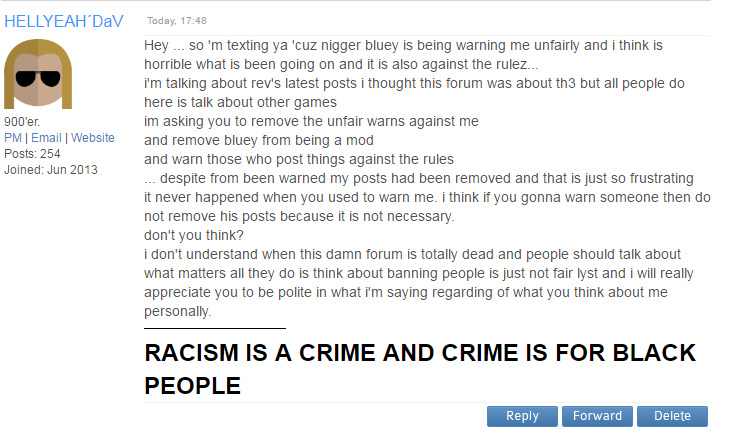 And don't worry, I can see exactly what Blueman is deleting or who he's warning for which post. Not that I have to check that, because I trust him, but since your argued his trustworthiness, I went to check it for you and I can come to no other conclusion then that Blueman did the right thing, applying the rules we have at this forum. If you think other people are breaking rules, use the report function. Pretty sure rule 5 states that. So instead of blaming others for your own behavior, you should be glad that you didn't get an extra warning on top of it for breaking another rule. hi Dav, it's not like i have something against you in particular. I am just trying to keep c3 clean. - 90% of your warns are related to "provoking" and "flamming"
(11-02-2016 16:30)bluey Wrote: hi Dav, it's not like i have something against you in particular. Well imagine an extreme situation against the rules of this forum: someone posting some obscene pics (I remember Emocore/8-bits doing that). Imo it would be weird to just warn/ban the user and keep the pics available on c3. This is not the spirit of c3. Your comments (the ones I deleted), at a lower scale, are the same for me. They are against the rules and not in the spirit of this peaceful and nice community. So no need to keep these posts if we want a clean forum. Well this makes sense for me..
(11-02-2016 17:06)bluey Wrote: Well imagine an extreme situation against the rules of this forum: someone posting some obscene pics (I remember Emocore/8-bits doing that). go join a thug2 forum amigo what are you doing here?? There are two scenarios, one where we leave the post and give you a warning. Since it's a provoking post, it could provoke a response from other members, which will turn into a fight, which is something we don't want as admins/mods. We want people to reply to the subject and not people calling each other names. The second scenario is where we delete the post and don't warn you. What exactly will prevent you from posting 1000 of these posts? Wasting a lot of our time and some of them will probably be visible for some time, since we're not around 24/7. Conclusion: We delete the post and hand out a warning.